Located at the western side of Myanmar with Hakha as its capital, the Chin State/Chin Hills stands tall at 3,053 metres, attracting mountaineers and hikers to visit Chin. The state is bordered by the Rakhine State, Bangladesh, Sagaing Region, Magway Division, and India. It is best for tourists to travel to Chin from Bagan all the way to Mindat, the entrance gateway to Chin. Mindat can be reached via a boat ride along the Ayeryarwaddy River, passing Kanma, Pauk, and Kyaukhtu. Tourists can then enjoy a drive up to Mount Victoria, the highest peak of Chin Hills. The roads are cut along mountainsides and alleys, providing tourists with a picturesque view of the state’s scenery. Origin: People from this state are of the Chin descent. Languages spoken in this region are Tedim, Lai, and Burmese. The main religions of the locals are Christianity and Theravada Buddhism. Geography: At the western side of Myanmar, Chin Hill is bordered by Rakhine, Bangladesh, Sagaing Region, Magway Division, and India. The size of Chin Hill is 36,018.8 sq km /13,906.9 sq mi, and the climate is mildly hot & wet. Interesting Facts: Most roads in Chin are built around the mountain to preserve its natural hilly landscape. Women from the Chin tribe have different patterns tattooed on their faces that distinguish them of their ethnic groups. Some of the rarest flora and fauna could be found in the Chin State. Chin is home to hundreds of species of flora and fauna. The sky island is rich with rare and protected flowers, plants, animals, and insects, providing tourists with a memorable tour in the exotic biodiversity found in Chin. The mountain is also a paradise for bird watchers as it houses 159 bird species consisting of indigenous, native, and migratory birds. Southeast Asia’s leopards, bears, and wild boars are well-protected here, giving tourists a unique experience of observing these animals in their natural habitat. The grand nine-tier waterfall provides tourists with plenty of activities to do while admiring the lush greenery surrounding it. On stone walls beside the waterfall, there are large bee hives attached on the sides, with rare blooming flowers flourishing the upper tiers. The path to the majestic waterfall from the village is smooth and shaded, giving visitors a comfortable and authentic experience of exploring the natural forest and observing the rare biodiversity and reptiles around the area. Famous for its resemblance to the shape of a heart, the Rih Lake is also known for turning into a reddish colour every December. The scenic lake is full of water all year long, providing visitors with ample opportunities to visit the lake at any time of the year. Located at the western part of the Falam Township, the lake is accessible by car and bus rides. The lake is also famous for the legend of two sisters. After the death of her younger sister, the older sister, Rih-i brought her back to life. Rih-I transformed into a pool of water to quench her sister’s thirst. She then roamed around as a mithun(ox) and, while searching for a safe place, settled in the present location, the Rih Lake. 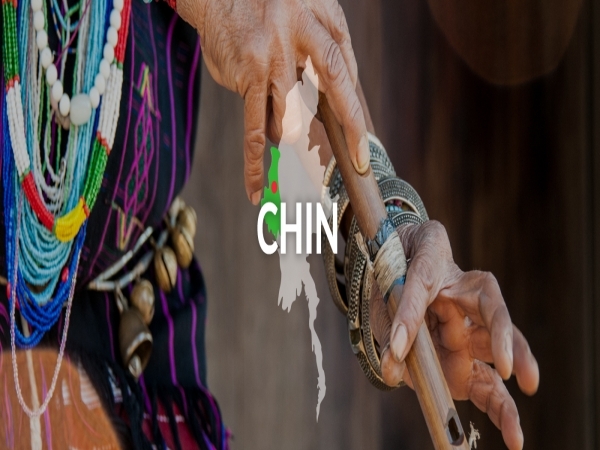 Chin State is rich with its culture and tribes, giving tourists ample opportunities to learn more about the unique place and its people. Visitors get to witness up-close the daily routines of the locals, like dressing up in traditional dresses, accessories and huge earrings, ploughing and harvesting paddy from the paddy fields, and joining them in fun festivals. Tourists can also interact with the villagers and understand more about each tribe in Chin State. The locals are more than willing to show their village to tourists, as well as taking them on a tour around exotic and untouched areas that are only known by the tribes. Hakha Situated on the slope of a mountain, the area is built in a U-shape to preserve the natural hilly landscape. At 1,890 m above sea level, the city is mostly covered by thick clouds in cold weathers, making the city appear mysterious and magical. The cool air also provides a refreshing getaway for those who wish to experience a holiday away from the bustling city. Kanpetlet As one of the most isolated towns in Chin State, Kanpetlet’s undisturbed scenery is mesmerising, especially before the sunset. Adventurous tourists can climb Mt. Victoria’s summit and take in the entire view of the Chin Hills from above. As the town is located on the mountain slope, tourists can also find rare species of birds and butterflies as they make their way to the top. Falam The capital of Falam District is a clean and tidy town where houses are built in multiple steps on the slope of a mountain range. Visitors get to visit Chin traditional houses in Ta Suan Village to observe unique village formations and ancient historical evidence of the town and its people. Architecture enthusiasts would love to see the beautiful colonial heritage buildings in the town. Mindat is the easiest town to reach in Chin Hills. Located in the Southern part of Chin, the town also serves as a trading hub for Southern Chin locals. The array of small, wooden houses, tall pine trees that line the roads and soaring mountains that shadow the tranquil town provide a captivating view of Mindat that tourists wouldn’t want to miss. Tedim derived its name from a pool that reflects the sunlight, creating a bright and sparkling effect. This prompted the locals to name it ‘Tedim’, “te” (bright, shine) and “dim” (twinkling, sparkling) using the Zomi language. Located in the countryside, tourists get to explore the endless beauty of Tedim by visiting dams, caves, peaks, and even churches with friendly locals as their guide. Matupi The town is nearly untouched as it was only recently opened to foreign tourists. Most of Matupi is covered in tropical and sub-tropical forests, creating a world of uninterrupted beauty within the town. Indulge in the rare opportunity to experience the untouched and raw grandeur of nature. As Matupi is home for several tribes, tourists get to experience the local traditional lifestyle of the community. HARVEST FESTIVAL: Locals would celebrate the Harvest Festival in February, making sticky rice from various natural produce like sesame seeds and peanuts. Witness how the festival is celebrated by the locals and have a chance to taste authentic sticky rice in the Chin State. CHIN NEW YEAR: Every year, locals would gather and celebrate the Chin New Year which is held in May. In this festival, locals perform a dance that represents their farewell to the old year, welcoming the new year with great wishes in happiness and health. The Sa Lan dance is performed to celebrate the people’s victory over their enemies. The Khuado Festival: Khuado is one of the Zomi (Chin) traditional festivals and is the most comprehensive festival of all. It is an elaborate ritual followed by communal feasting. As the festival is celebrated after harvesting crops from the field, it is known as the celebration of the successful harvesting of the year.